Burnell Harvey “Jack” Maddox, 89, of New Bloomfield passed away at his home on Friday, March 29, 2019. He was born in Callaway County on November 24, 1929, the son of the late Fay Moore Maddox and the late Winnie Lee (Harvey) Maddox. On January 4, 1949, Jack married Eva Mae (Maddox) Maddox. She preceded him in death on March 17, 2007. Jack proudly served his country in the United States Air Force. He was a member of New Bloomfield Christian Church where he served as an Elder. Jack worked for many years at Callaway Lumber and later at LaCrosse Lumber Company. Active in his community, he served on the Special Road District Board of Directors and the New Bloomfield School Board. 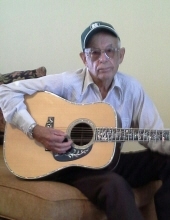 Jack loved music and playing guitar. He was a member of The Kingdomaires band. He was gifted at woodworking and made many things for his family. Jack will be fondly remembered by two sons, Bruce Maddox (Brenda), and Troy Maddox (Robin), all of New Bloomfield; sister, Juanita Bura (David) of Fulton; grandchildren, Bridget Maddox, Jenelle Maddox-Nieto (Monico), Brandon Maddox (Lynne) and Latham Maddox (Marci); great-grandchildren, Chase L. Maddox and Gage C. Maddox; and numerous nieces and nephews. In addition to his parents and wife, Jack was preceded in death by step-mother, Louise Maddox; sisters, Ruth Edwards, Betty Nichols, and Treva Vandeloecht; brother, Elton (Cork) Maddox; and grandson, Preston Nieto. Funeral services will be held at 1:00 p.m. on Tuesday, April 2, 2019 at Maupin Funeral Home in Fulton with Reverend Joe Gibson officiating. Friends will be received from 5:00 p.m. until 7:00 p.m. on Monday, April 1, 2019 at the funeral home. Interment with Military Honors will be in Callaway Memorial Gardens. Memorial donations are suggested to New Bloomfield Christian Church, c/o Maupin Funeral Home, 301 Douglas Boulevard, Fulton, MO 65251. To send flowers or a remembrance gift to the family of Burnell Harvey "Jack" Maddox, please visit our Tribute Store. "Email Address" would like to share the life celebration of Burnell Harvey "Jack" Maddox. Click on the "link" to go to share a favorite memory or leave a condolence message for the family.